Went through a after-work stroll through Bear Creek and took my camera. Managed to capture some half-decent photos, a number of a bunch of interesting birds, including: a common goldeneye duck, a female belted kingfisher, an american coot, and a hooded merganser. Oh, and a couple of bunny rabbits too. 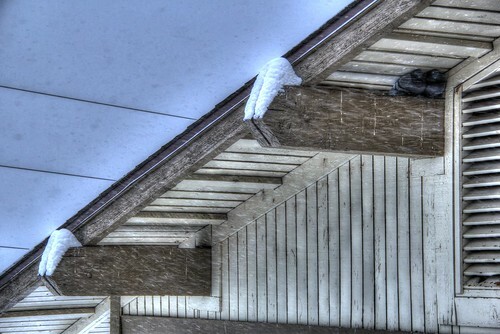 Saw this sad pair of pigeons huddled under the eaves for shelter on my way home from work. Not really my style of music, but the Vandross quote was just too appropriate to pass up. Yesterday in Denver, CO it was in the 60’s and I actually wore shorts for a while. Today, 4-5 inches of snow. Tomorrow they are saying the high temperature will only be 19 degrees with a low of -1 degree. BRRRRRR! One of my New Year’s Resolutions is to take at least ONE photo every day (even if I have to take a quick pic with my phone). I will then post it (hopefully the same day) and mark it Day 1 to Day 365. I’ll be posting these “photo of the day” pics to this blog and tagging them “2014 365 Project”. I’ll also be posting them to a “2014 365 Project set” on my FLICKR account. As it is New Year’s Eve day, I figured I would post the photo below today as kind of a prologue and public commitment towards my new resolution. The photo above was actually serendipitous as I was originally trying to take the photo below; which, while interesting, was a fairly standard picture of a starling sitting on the power line outside my apartment window singing to the rising sun. To my surprise as I looked through the viewfinder, the geese happened to fly into the background, so I quickly recomposed and shot. Since I was at 200mm and not set up for any kind of depth of field the geese were of course out of focus, but I think the blurred silhouettes add to the look; particularly when I dumped all the saturation for a more “artsy” black and white photo. If only the starling had looked to his right (towards the geese) just at that moment, it would have been perfect. Got the day off work today, and slept in a little this morning. I had removed a box fan from one of my apartment windows, and I was just standing looking out the wide open window enjoying the view when I noticed some birds. On the far side of some tennis courts on the school grounds that neighbor my apartment complex, I saw two big blue jays and a larger black bird I could not identify. Curious, I got out my binoculars and checked the trio of birds out. The mysterious stranger was just a big crow. The hyper-territorial jays had probably been harassing it, and now they were all just resting on top of the tennis court fences eyeing each other warily.